Peter Kuitenbrouwer is a working on a master of forest conservation at the University of Toronto. He has written for Toronto Life, Maclean's, and Chatelaine. By the time my family moved to Quebec in 1968, the province had long since stopped singing Canada’s national anthem. At age seven, I attended an English public school on the south shore of Montreal. I recall that—in what today seems a declaration that, yes, the British won the war on the Plains of Abraham—every morning we stood and sang “God Save the Queen.” Later, at a French Catholic school, we recited the Lord’s Prayer (“Au nom du Père, et du Fils et du Saint-Esprit, amen”). Even at my English high school in Lachute, “O Canada” never crossed my lips. It took twenty-five years (and a move to Toronto) before I heard the song in a school. One day, as I dropped off my daughter, I heard “O Canada” being played over the PA system. To my delight, the children sang along using the original French words. My anthem-less childhood was—and remains—a common experience in Quebec. Unlike other provinces, Quebec has no guidelines or laws requiring principals to play “O Canada,” and many administrators are happy not to, even now, as the country marks its 150th year of Confederation. The song’s absence is felt in these communities. The hamlet of Calixa-Lavallée, population 504, is a perfect example. Regardless of the fact that the burg gets its name from its most famous son, Calixa Lavallée, who composed the anthem nearly 140 years ago, the town has no Canada Day celebrations planned, and its council members do not sing his anthem before meetings. “O Canada” is an orphan. The people of Quebec have disowned the tune. Its adoptive family in English Canada knows little of its childhood and often mumbles out the words—half in English, half in French—without understanding what they’re singing. There is a chance that the two solitudes may never sing together again. Born in 1842 in southern Quebec, Calixa Lavallée was Canada’s original hitmaker. He landed his first gig at age nine: he played the organ barefooted in a St-Hyacinthe church. At fifteen, he followed minstrels from Montreal to New Orleans. Lavallée enlisted in the Union army at the outset of the American Civil War and served as a cornetist; he was wounded and discharged with a monthly pension of $8. Lavallée then worked as a composer, travelling through Quebec, Boston, and France. His big break came in 1880, when the Société Saint-Jean-Baptiste, a group created for the growing French population of the new world, commissioned a party song. Lavallée composed the music to “O Canada,” and Adolphe-Basile Routhier, a Quebec judge and poet, wrote the French lyrics. At a skating pavilion in Quebec City on June 24, 1880, during a celebration of the province’s Saint-Jean-Baptiste Day, more than 500 guests first sang what would become Canada’s national anthem. English canada’s slow adoption of the anthem is chronicled in the yellowed news clippings preserved at Library and Archives Canada in Ottawa. The first known performance outside of Quebec was in 1901, when the Duke and Duchess of Cornwall and York inspected Canadian troops in Toronto. The infantry played them an instrumental version of the song. Official English lyrics wouldn’t come for another twenty years. The government of William Lyon Mackenzie King sought to publish the song for the Diamond Jubilee of Confederation. The problem was, people across English Canada had adopted—and preferred—different lyrics. One sang, “O Canada! Beloved country thou.” Another spoke of “Lord of the lands! Beneath Thy bending skies.” One, written in 1908, by Montreal judge Robert Stanley Weir, stood out. It began, “O Canada, our home and native land.” In 1927, the federal government published Weir’s lyrics. Fast forward to 1980. The 100th birthday of “O Canada” arrived the same year that Quebec voted in a referendum on separation from the rest of Canada. The province ultimately chose to stay. To celebrate the result, Parliament unanimously passed the National Anthem Act, which made “O Canada” our official song (and added the phrases “from far and wide” and “God keep our land” in English; the French lyrics have never changed). In the House of Commons, members of Parliament stood and sang their newly minted anthem. Pierre Trudeau’s Liberals held seventy-four of Quebec’s seventy-five seats, and these MPs sang with gusto. The town of Calixa-Lavallée, situated some fifty kilometres northeast of Montreal, is full of eighteenth-century stone homes with double chimneys and metre-thick walls. Wooden crosses dot its little country roads, highlighting the area’s deep Catholic roots. Despite its name, however, patriotism does not ooze from the earth. The hamlet was originally called Ste-Théodosie. Its name was changed in 1974, but not out of love for the composer: city councillors told me they went with “Calixa-Lavallée” because it was easier to pronounce; besides, some outsiders had nicknamed the town “Ste-Toutoune”—slang for a fat woman—so a change was needed. There is one place in the province where “O Canada” has always garnered some level of respect: at Montreal Canadiens home games. For a long time, the audience stood in silence as a performer sang the tune. 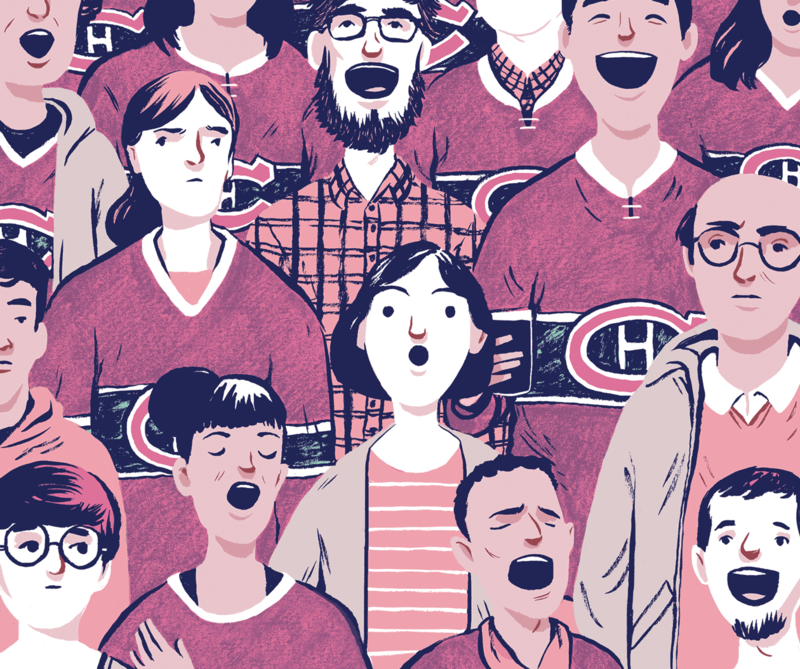 “In the last few years, I’ve noticed the fans have started to sing along,” says Patrice Ryan, a lifelong Habs fan and president of the Federal Idea, a federalist Quebec think tank. The crowd sings a bilingual version of the song, belting out the first four lines in French and the final four in English. “I don’t think too many people remember the last few lines in French,” he says. While the anthem may just be a way for the crowd to get in the face of American opponents, it could be a sign that the province will one day reunite with the song that once defined its people. But that may be overly optimistic. My mother, who lives in western Quebec, says her French choir is practicing a whole raft of historical Canadian songs for a concert that honours our country’s 150th birthday. “O Canada,” however, is not on the program. Jonathan Dyck is an illustrator living in Winnipeg. His work has appeared in the Literary Review of Canada and Alberta Views. Is the viscous green sludge that coats the water an ecological disaster—or just a nuisance for beachgoers?